ER wheels are made with an engineered composite of rubber and plastic. They are more durable and higher performance than our previous models’ puncture-proof wheels which were EVA (a solid plastic). The addition of rubber to the wheel composition provides greater shock absorbency for vibrations and bumps, and also provides a wheel that will last longer. 100% of the wheel is the ER composite material. PU wheels have a 100% outer rubber tread, with the inner of the wheel being filled with a polyurethane foam. Together, the 100% rubber outer tread and the foam fill results in a puncture-proof solution that is the closest in performance to an air wheel. Maintaining the rubber tread creates superior surface grip. We have engineered a narrow ridge on the widest point of the front and rear wheels which minimises the surface area of the wheel that has contact with the ground. This also minimises bumps and vibrations, while delivering a more durable and hard-wearing wheel. 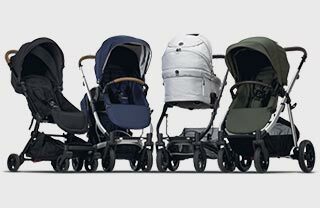 Air wheels provide an excellent solution for customers that desire an exceptionally smooth ride from their pram. However, this comes with maintenance (pumping and inner-tube replacement over time). While air tyres are an excellent solution, based on feedback from our customers that requested a puncture-proof, low maintenance solution, we have engineered our new ER/PU wheels to provide the highest performance for the products they have been specifically designed for (METRO² – extremely lightweight, JIVE² – to be able to carry two children, while still being as lightweight as possible).